Canada is one of the world's premier producers of icewines. Known for its sweetness and complexity of flavours, the wine is prized by tourists from the US, Europe and the Far East as well as Canadians. It is the number question asked of this website "Where can I buy icewine"
Both Ontario and British Columbia icewine standards are determined by the Vintners Quality Alliance - VQA - It is similar to other regulatory systems in place in such countries as France (AOC), Italy (DOC), and Germany (QmP), and ensures the consumer of high quality Canadian wine. Icewine must be produced exclusively from grapes that have been harvested, naturally frozen on the vine, and pressed in a continuous process while the air temperature is -8° Celsius (17.6°F) or lower. 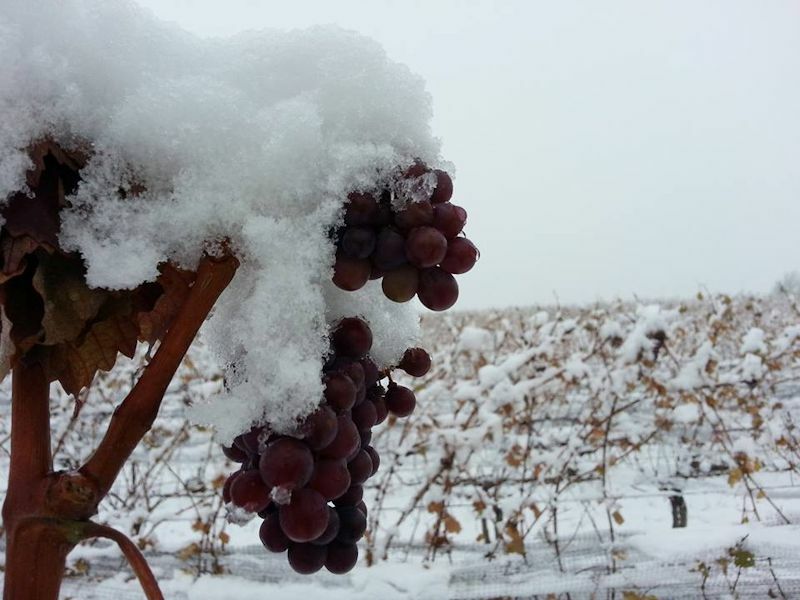 Icewine grapes are often harvested during the night to guarantee a temperature below -8° Celsius. Icewine must be made of grapes pressed within the recognized Viticultural Area in which the grapes were grown and meet the requirements of a varietal wine. The grapes, juice, must or wine may not be artificially refrigerated at any point in the manufacturing process, except for tank cooling during fermentation and/or during cold stabilization prior to bottling. Icewine must be made exclusively from British Columbia grapes, and from authorized grape varieties. The grapes must be naturally frozen on the vine, and processed while the air temperature is minus 8 degrees Celsius or lower. Artificial refrigeration of the grapes or the juice, must or wine for the purpose of increasing must weight is prohibited at any point in the production process except for temperature control during fermentation and cold stabilization prior to bottling. ~ No batch less than 32° brix may be used. The VQA recognizes within Ontario three designated Viticultural Areas: Niagara Peninsula, Pelee Island, and Lake Erie North Shore. A wine must meet or exceed production and appellation standards before it can use specific geographic designation on its label. OTTAWA, ONTARIO--(Marketwired - June 25, 2013) - The Government of Canada is proposing to create a national standard for icewine that will require icewine to be made only from grapes naturally frozen on the vine. "Canada is one of the world's largest producers of icewine. These changes will harmonize Canada's definition of icewine with the World Wine Trade Group's Agreement on Requirements for Wine Labelling," said Agriculture Minister Gerry Ritz. "The proposed regulatory amendments will also benefit exporters by allowing greater market access." Also included in the proposed regulatory amendments are changes to the Consumer Packaging and Labelling Regulations to allow the mandatory labelling information on wine bottles and boxes to be displayed in a single field of vision, which means that it can be seen without having to turn the container. Also included are minor text amendments to the Food and Drug Regulations and to the Consumer Packaging and Labelling Regulations . It is expected that the proposed regulatory amendments will allow wine exporters to have greater market access without having to redesign their labels for each individual country's requirements. The proposed national standard is also expected to help prevent the sale of fraudulent icewine. The proposed regulatory amendments will not change the mandatory labelling information on the container, which includes common name, net quantity, country of origin and alcohol content by volume, to ensure that Canadians can make informed decisions. The provinces and provincial liquor authorities are the lead in ensuring that alcoholic beverages, including wines, conform to provincial laws and Canadian standards. Individual provincial liquor authorities may also develop additional standards for wine sold within their province. The CFIA has consulted with provincial authorities on the proposed regulatory amendments and proposed national standard. The proposed amendments to the Canada Agricultural Products Act , the Food and Drugs Regulations and the Consumer Packaging and Labelling Regulations were published in Canada Gazette, Part 1 on June 15, 2013.